53 Columbia Law Review, 1953. 33 Harvard Law Review, 1919. 103 Harvard Law Review, 1990, Num. 7. Adams, John Quincy; Writings of John Quincy Adams, 7 vols., edited by Worthington Chauncey Ford, Macmillan Co., New York, 1913-1917. Alinsky, Saul D., Rules for Radicals: A Pragmatic Primer for Realistic Radicals, 1971, Vintage Books, a division of Random House, Inc., New York. The Annals of America, 20 Vols. ; 1976, Encyclopædia Britannica Corporation, Chicago, Illinois. The Anti-Federalist Papers and the Constitutional Convention Debates, introduction & editing by Ralph Ketcham, 1986. Mentor, 375 Hudson St.; New York, New York 10014, USA. Augustine of Hippo; Of Free Choice of the Will (De Libero Arbitrio), translated, introduced, and noted by Thomas Williams; 1993, Hackett Publishing Company, Inc., P.O. Box 44937, Indianapolis, Indiana 46244-0937. Backus, Isaac; Isaac Backus on Church, State, and Calvinism, edited by William G. McLoughlin, 1968, Belknap Press of Harvard University Press, Cambridge, MA. Black, Henry Campbell, M. A.; Black’s Law Dictionary, 5th edition by publisher’s editorial staff, 1979. West Publishing Co., St. Paul. Blackstone, William; Blackstone’s Commentaries on the Laws of England, 4 vols., first edition printed at Clarendon Press, Oxford, 1765-1769. Blum, John M.; Catton, Bruce; Morgan, Edmund S.; Schlesinger, Arthur M., Jr.; Stampp, Kenneth M.; Woodward, C. Vann; The National Experience: A History of the United States, 2nd Edition; 1963, 1968; Harcourt, Brace & World, Inc.
Bouvier, John; Bouvier’s Law Dictionary & Concise Encyclopedia, 1914. West Publishing, St. Paul, Minnesota. Brennan, Richard P.; Dictionary of Scientific Literacy, 1992, John Wiley & Sons, Inc.
B’rit Chadashah — Same as Brit Chadashah. Carson, Clarence B.; A Basic History of the United States — Volume 5: The Welfare State 1929-1985, 1985; American Textbook Committee; Rt. 1 Box 13; Wadley, Alabama 36276. ______ A Basic History of the United States — Volume 4: The Growth of America 1878-1928, 1985; American Textbook Committee; Rt. 1 Box 13; Wadley, Alabama 36276. ______ A Basic History of the United States — Volume 3: The Sections and the Civil War 1826-1877, 1985; American Textbook Committee; Rt. 1 Box 13; Wadley, Alabama 36276. ______ A Basic History of the United States — Volume 1: The Colonial Experience 1607-1774, 1983, American Textbook Committee; Rt. 1 Box 13; Wadley, Alabama 36276. Cohen, Rabbi Jeffrey M.; Blessed Are You: A Comprehensive Guide to Jewish Prayer, 1993. Jason Aronson, Inc., Northvale, New Jersey. Curry, Thomas J.; The First Freedoms: Church and State in America to the Passage of the First Amendment, 1987, Oxford University Press, 198 Madison Ave, New York, NY 10016. Dictionary of Philosophy, edited by D.D. Runes, 1983. Philosophical Library, Inc.; 200 West 57th Street, New York, N.Y. 10019. Reprinted in 1984 as a Helix Book, published by Rowman & Allanheld, Publishers (a division of Littlefield, Adams & Company) 81 Adams Drive, Totowa, New Jersey, 07512. Documents Illustrative of the Formation of the Union of the American States, selected by Charles C. Tansill, 1927, issued as House document no. 398 of 69th Congress. Edwards, Jonathan; The Works of Jonathan Edwards, 2 Vols., Hendrickson Publishers, Inc., P.O. Box 3473, Peabody, Massachusetts 01961-3473; Third Printing January, 2003. English Standard Version, The Holy Bible, translated by Crossway Bibles, 2001, Good News Publishers, Wheaton, Illinois 60187. Epps, Garrett; To an Unknown God: Religious Freedom on Trial, 2001, St. Martin’s Press, 175 Fifth Avenue, New York, N.Y. 10010. Evers, Williamson M.; "Toward a Reformulation of the Law of Contracts", Vol. 1, No. 1. pp. 3-13, Journal of Libertarian Studies, Murray N. Rothbard, ed., Pergamon Press, 1977. ______ "Social Contract: A Critique", Vol. 1, No. 3, pp. 185-194, Journal of Libertarian Studies, Murray N. Rothbard, ed., Pergamon Press, 1977. The Federalist Papers, introduction & editing by Clinton Rossiter, 1961. Mentor; NAL Penguin Inc., 375 Hudson Street; New York, New York 10014; USA. Foster, Marshall and Swanson, Mary-Elaine; The American Covenant: The Untold Story, 1981, Foundation for Christian Self-Government; 1983, Mayflower Institute. Fuller, Daniel P.; Gospel and Law: Contrast or Continuum? The Hermeneutics of Dispensationalism and Covenant Theology, 1980. William B. Eerdmans Publishing Co., 255 Jefferson Ave. SE, Grand Rapids, Mich. 49503. ______ The Unity of the Bible: Unfolding God’s Plan for Humanity, 1992. Zondervan Publishing House, Academic and Professional Books, Grand Rapids, Michigan 49530. Graham, John Remington; Principles of Confederacy: The Vision and the Dream & The Fall of the South, 1990. Northwest Publishing Inc., 5949 South 350 West, Salt Lake City, Utah 84107, 801-266-5900. Griffin, G. Edward; The Creature from Jekyll Island: A Second Look at the Federal Reserve, 4th edition, 2002. American Media, P.O. Box 4646, Westlake Village, California 91359-1646 (URL: http://www.​realityzone.​com/). Grudem, Wayne; Systematic Theology: An Introduction to Biblical Doctrine, 1994. Zondervan Publishing House, 5300 Patterson Avenue S.E., Grand Rapids, Michigan, USA. Hening, William Waller; Statutes at Large: Being a Collection of all the Laws of Virginia from the first session of the Legislature, in the Year 1619; 13 Vols. covering 1619-1792, printed 1819-1823. Iserbyt, Charlotte Thomson, The Deliberate Dumbing Down of America: A Chronological Paper Trail, 1999, Conscience Press, Rarsuma, Ohio. Jefferson, Thomas; Thomas Jefferson, The Life and Selected Writings of, edited and with an introduction by Adrienne Koch and William Peden, 1944, 1972, 1993; 1998 Modern Library Paperback Edition. Random House, Inc., New York. ______ The Writings of Thomas Jefferson, Memorial Edition, 20 Vols. edited by Lipscomb and Bergh, 1903-1904, Thomas Jefferson Memorial Association, Washington, D.C.
Kass, Leon R.; The Beginning of Wisdom: Reading Genesis, 2003. Free Press, a Division of Simon & Schuster, Inc., 1230 Avenue of the Americas, New York, NY 10020. Keener, William Albert; A Treatise on the Law of Quasi-Contracts, 1893. Baker, Voorhis and Company, New York. Keynes, John Maynard; The Economic Consequences of the Peace, 1920. Harcourt Brace Jovanovich, New York. ______ "The End of Laissez-Faire", 1926; Prometheus Books, 59 John Glenn Drive, Amherst, New York 14228-2197; 2004. ______ The General Theory of Employment, Interest and Money, 1935, Macmillan Cambridge University Press, for Royal Economic Society, 1936. King James Version: The Holy Bible; originally issued ANNO DOM. 1611. Koire, Rosa; Behind the Green Mask: U.N. Agenda 21, 2011, The Post Sustainability Institute Press, P.O. Box 15192, Santa Rosa, CA 95402. Long, Carolyn N.; Religious Freedom and Indian Rights: The Case of Oregon v. Smith, 2000, University Press of Kansas, Lawrence, Kansas 66049. Machiavelli, Niccolo; The Prince and selections from The Discourses, translated by Daniel Donno, 1966, New York: Bantam Books, Inc.
Madison, James; The Writings of James Madison, edited by Gaillard Hunt, 1901, G.P. Putnam’s Sons, New York & London. Maimonides; The Commandments: Sefer Ha-Mitzvoth of Maimonides, translated by Rabbi Dr. Charles B. Chavel, 1967, The Soncino Press, London & New York. "A Man For All Seasons", 1966, movie presented by Columbia Pictures; produced and directed by Fred Zinnemann; original play and screenplay by Robert Bolt; executive producer William N. Graf; Highland Films, Ltd.
Marshall, Peter J., Jr. & Manuel, David B., Jr.; The Light and the Glory, 1977. Fleming H. Revell, a division of Baker Book House Company, P.O. Box 6287, Grand Rapids, Michigan 49516-6287. ______ From Sea to Shining Sea, 1986, Fleming H. Revell, a division of Baker Book House Company, P.O. Box 6287, Grand Rapids, Michigan 49516-6287. Mason, George; The Papers of George Mason, 1725-1792, 3 vols., edited by Robert A. Rutland, 1970, University of North Carolina Press, Chapel Hill, North Carolina. Mayhew, Jonathan; "A Discourse Concerning Unlimited Submission and Nonresistance to Higher Powers", 1750, reprinted in Pamphlets of the American Revolution, edited by Bernard Bailyn; Harvard University Press, Cambridge, 1965. Modern American Law: A Systematic and Comprehensive Commentary on the Fundamental Principles of American Law and Procedure, Accompanied by Leading Illustrative Cases and Legal Forms, with a Revised Edition of Blackstone’s Commentaries, 15 vols., edited by Eugene Allen Gilmore and William Charles Wermuth, 1914, Blackstone Institute, Chicago. Montesquieu, Baron de, Charles de Secondat; The Spirit of the Laws, ~1734, Cambridge University Press, 40 West 20th Street, New York NY 10011-4211, 1989. Morley, Felix; Freedom and Federalism, , 1959, Henry Regnery Co., A Gateway Edition, Chicago. New American Standard Bible, translated by The Lockman Foundation, La Habra, California, 1997; Foundation Publications, Inc., Anaheim, California, 92816. One Nation Under God: The Triumph of the Native American Church, compiled and edited by Huston Smith and Reuben Snake, foreword by Senator Daniel K. Inouye, Clear Light Publishers, 823 Don Diego, Santa Fe, New Mexico 87501, 1996. The Oxford Companion to the Supreme Court of the United States, editor in chief, Kermit L. Hall, 1992. Oxford University Press, Inc.; New York. The Oxford Dictionary of Quotations, 3rd Edition, 1979; Oxford University Press. The Oxford Universal Dictionary of Historical Principles, 3rd ed., 1944, Oxford at the Clarendon Press. Pascal, Blaise; Pensées, 1660, translated by W.F. Trotter, New York: E.P. Dutton, 1958. Patterson, Bennett; The Forgotten Ninth Amendment, 1955, Bobbs-Merrill Co., Inc., Indianapolis. Piper, John; God’s Passion for His Glory, a commentary on Edwards’s "The End for Which God Created the World", 1998; Crossway Books, 1300 Crescent Street, Wheaton, Illinois 60187. ______What Jesus Demands from the World, 2006, Desiring God Foundation, Crossway Books, 1300 Crescent Street , Wheaton, Illinois 60187. Popper, Karl; The Logic of Scientific Discovery (Logik der Forschung), 1935 (2002, The Estate of Karl Popper); Routledge Classics, 29 West 35th Street, New York, NY 10001. Porter, Charles Raleigh, III; A Theodicy: Science, Bible, & Law, 2nd ed., 2015; Jural Society Press, Eden Prairie, Minnesota (URL: ../3_Contact/). ______ A Memorandum of Law & Fact regarding Natural Personhood, 2014; Jural Society Press, Eden Prairie, Minnesota (URL: ../3_Contact/). ______Basic Jurisdictional Principles: An Investigation into the Biblical Deposition of Human Law and Divine Grace (An unpublished work. For more information, URL: ../3_Contact/). The Psychological Review; American Psychological Association, Washington, D.C.
Rossiter, Clinton; Constitutional Dictatorship: Crisis Government in the Modern Democracies, 2nd edition, 1963, Harbinger, New York. Rothbard, Murray N.; For a New Liberty: The Libertarian Manifesto, 1978, Collier Macmillan Publishing Co., New York. ______ The Ethics of Liberty, 1982, Humanities Press, Atlantic Highlands, N.J.
Rushdoony, R. J.; The Foundations of Social Order: Studies in the Creeds and Councils of the Early Church, 1968, Presbyterian and Reformed, Nutley, New Jersey. Salleilles, Raymond; De la Declaration de Volonté, 1901. Smith, Len Young, and Roberson, G. Gale; Smith and Roberson’s Business Law, Uniform Commercial Code Third Edition, 1971, West Publishing Co., St. Paul, Minn.
Sproul, R.C. ; Knowing Scripture, 1977, InterVarsity Christian Fellowship, Downers Grove, Illinois 60515. Standard College Dictionary, Funk & Wagnalls, 1963, 1966, 1968 by Funk & Wagnalls, a Division of Reader’s Digest Books, Inc., New York. Stern, David H.; Jewish New Testament Commentary, 1992. Jewish New Testament Publications, Post Office Box 1313, Clarksville, Maryland 21029, USA, Telephone (410)764-6144; Israel Office: 78 Manahat, 96901 Jerusalem, Israel. ______ (translator); Complete Jewish Bible, 1998. Jewish New Testament Publications, Inc., P. O. Box 615, Clarksville, Maryland 21029, USA, Telephone (410)764-6144; Messianic Jewish Resources International (div. of Lederer Foundation), 6204 Park Heights Avenue, Baltimore, MD 21215 USA, (800)4107367. Stewart, Omer C.; Peyote Religion: A History, 1987, University of Oklahoma Press, Norman, Publishing Division of the University. Strong, James; The New Strong’s Exhaustive Concordance of the Bible, 1995, Thomas Nelson Publishers, Nashville, Tennessee. Tanakh — Same as Tanakh. Trenchard, John, and Gordon, Thomas; Cato’s Letters, 1720-1723, in The English Libertarian Heritage, David Louis Jacobson, ed., Bobbs-Merrill, Indianapolis, Indiana, 1965. Unger, Merrill F.; The New Unger’s Bible Dictionary, edited by R.K. Harrison, 1988. Moody Press, Chicago. Vine, W.E. ; Unger, Merrill F.; White, Jr., William; Vine’s Expository Dictionary of Biblical Words, 1985, Thomas Nelson Publishers. Washington, George; George Washington on Religious Liberty and Mutual Understanding, edited by Edward Frank Humphrey, 1932, National Conference of Jews and Christians, New York. Webster’s New World Dictionary of the American Language, College Edition, World Publishing Company, 1966, Cleveland and New York. Webster’s Seventh New Collegiate Dictionary, G. & C. Merriam Co., 1967; Springfield, Massachusetts, U.S.A.
Winthrop, John; Winthrop Papers, 6 Vols., Massachusetts Historical Society: Boston. John Adams’ letter to Archibald Bulloch, July 1, 1776, at Library of Congress, URL: http://memory.​loc.​gov/​cgi-bin/​query/​r?ammem/​hlaw:@field(​DOCID​+@lit​(dg004270)). Samuel Adams’ speech at Philadelphia State House, August 1, 1776, in The Life and Public Services of Samuel Adams at Google Books, pp. 403-422, URL: https://books.​google.​com/​books?​id=​KF0sAAAAMAAJ. The American Heritage Dictionary of the English Language: Fourth Edition. 2000, URL: http://www.​thefreedictionary.​com/​dictionary.htm. Annals of Congress at Library of Congress, URL: http://memory.​loc.​gov/​ammem/​amlaw/​lwac.html. "An address of the Congress to the inhabitants of the United States", May 9, 1778, at Library of Congress, URL: http://www.​loc.​gov/​item/​90898049/. Thomas Aquinas, The Summa Theologica, First Part of the Second Part, Treatise on Law, Question #91, "Of the Various Kinds of Law", URL: http://www.​ccel.​org/​a/​aquinas/​summa/​FS/​FS091.html. Aaron Russo’s "America: Freedom to Fascism", URL: https://www.​youtube.​com/​watch?​v=uNNeVu8wUak. Articles of Confederation at University of Oklahoma Law Center, URL: http://www.​law.​ou.​edu/​hist/​artconf.html. Articles of Confederation in Statutes-at-Large at Library of Congress, URL: http://memory.​loc.​gov/​cgi-bin/​ampage?​collId=​llsl&​fileName=​001/​llsl001.db&​recNum=127. Becraft’s "Memorandum of Law: The Money Issue", URL: http://home.​hiwaay.​net/​~becraft/​MONEYbrief.html. Blackstone’s Commentaries at LONANG Institute, URL: http://lonang.​com/​library/​reference/​blackstone-commentaries-law-england/. Blackstone’s Commentaries at Yale’s Avalon Project, URL: http://avalon.​law.​yale.​edu/​subject_menus/​blackstone.asp. John Bunyan’s biography at Wholesome Words, URL: http://www.​wholesomewords.​org/​biography/​biorpbunyan.html. Bunyan’s Pilgrim’s Progress at Christian Classics Ethereal Library, URL: http://www.​ccel.​org/​b/​bunyan/​pilgrims_progress/​title.html. Code of Federal Regulations at the Government Printing Office, URL: http://www.​gpo.​gov/​fdsys/​browse/​collectionCfr.​action?​collectionCode=​CFR. Constitution at National Archives, URL: http://www.​archives.​gov/​national_archives_experience/​charters/​constitution.html. Declaration of Independence ("original Rough draught") at Library of Congress, URL: http://www.​loc.​gov/​exhibits/​treasures/​trt001.html. Declaration of Independence in Statutes-at-Large, URL: http://memory.​loc.​gov/​cgi-bin/​ampage?​collId=​llsl&​fileName=​001/​llsl001.db&​recNum=124. Declaration of Independence Stone Engraving at National Archives, URL: http://www.​archives.​gov/​national_archives_experience/​charters/​declaration_zoom_2.html. Bible-based theology at "Desiring God" website, URL: http://www.​desiringgod.​org/. Edwards’s "The End for Which God Created the World", URL: http://www.​ccel.​org/​ccel/​edwards/​works1.​iv.html. Edwards’s "A Careful and Strict Enquiry into the . . . Freedom of the Will", URL: http://www.​ccel.​org/​ccel/​edwards/​works1.​iii.html. Elliot’s Debates at Library of Congress, URL: http://memory.​loc.​gov/​ammem/​amlaw/​lawhome.html. Evers’ "Social Contract: A Critique" at Ludwig von Mises Institute, URL: http://mises.​org/​journals/​jls/​1_3/​1_3_3.pdf. Evers’ "Toward a Reformulation of the Law of Contracts" at Ludwig von Mises Institute, URL: http://mises.​org/​journals/​jls/​1_1/​1_1_2.pdf. Federal Rules of Civil Procedure at Cornell’s Legal Information Institute, URL: https://www.​law.​cornell.​edu/​rules/​frcp. Federalist Papers at Library of Congress, URL: http://thomas.​loc.​gov/​home/​histdox/​fedpapers.html. Ferrand’s Records at Library of Congress, URL: http://memory.​loc.​gov/​ammem/​amlaw/​lawhome.html. The First Great Seal Committee at GreatSeal.com, URL: http://www.​greatseal.​com/​committees/​firstcomm/. 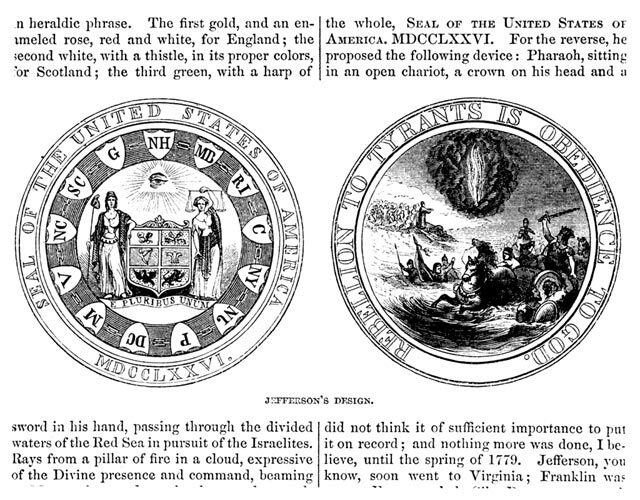 The First Great Seal Committee’s proposed back side at Library of Congress, URL: http://www.​loc.​gov/​exhibits/​jefferson/​images/​vc100.jpg. The Great Seal at GreatSeal.com, URL: http://www.​greatseal.​com/. Green, Leslie, "Legal Positivism", The Stanford Encyclopedia of Philosophy (Fall 2009 Edition), Edward N. Zalta (ed. ), URL: http://plato.​stanford.​edu/​archives/​fall2009/​entries/​legal-positivism/. Hafemann’s "The Use of the Bible in Daily Life: The Question of Hermeneutics" at Wheaton College, URL: http://www.​wheaton.​edu/​FandL/​pdf/​Hafemann.pdf. Hamilton, Marci, "American Taliban" at Findlaw’s Writ, URL: http://writ.​news.​findlaw.​com/​hamilton/​20020103.html. Hamilton’s "Federalist No. 78" at Constitution Society, URL: http://www.​constitution.​org/​fed/​federa78.htm. Hamilton’s "Federalist No. 78" at Library of Congress, URL: http://thomas.​loc.​gov/​home/​histdox/​fed_78.html. Hamilton’s "Federalist No. 78" at Yale’s Avalon Project, URL: http://avalon.​law.​yale.​edu/​18th_century/​fed78.asp. Hamilton’s "Federalist No. 84" at Constitution Society, URL: http://www.​constitution.​org/​fed/​federa84.htm. Hauben’s "History of ARPANET", URL: http://www.​bibliotecapleyades.​net/​sociopolitica/​sociopol_DARPA10.htm. IRS Publication 526, "Charitable Contributions", URL: http://www.​irs.​gov/​pub/​irs-pdf/​p526.pdf. IRS Publication 557, "Tax-Exempt Status for Your Organization", URL: http://www.​irs.​gov/​pub/​irs-pdf/​p557.pdf. Jefferson’s letter to Thomas Cooper in 1814, at Constitution Society, URL: http://www.​constitution.​org/​tj/​jeff14.txt. Jefferson’s Second Inaugural Address at Yale’s Avalon Project, URL: http://avalon.​law.​yale.​edu/​19th_century/​jefinau2.asp. Jones, Alex, "Endgame: Blueprint for Global Enslavement", URL: https://www.​youtube.​com/​watch?​v=​x-CrNlilZho. Judiciary Act of 1789 in Statutes at Large at Library of Congress, URL: http://memory.​loc.​gov/​cgi-bin/​ampage?​collId=​llsl&​fileName=​001/​llsl001.db&​recNum=196. Keynes’ The General Theory of Employment, Interest, and Money at Marxists Internet Archive, URL: https://www.​marxists.​org/​reference/​subject/​economics/​keynes/​general-theory/. Lincoln’s Gettysburg Address, 19 Nov. 1863, at University of Oklahoma Law Center, URL: http://www.​law.​ou.​edu/​hist/​getty.html. Lincoln’s letter to Horace Greeley, 22 Aug. 1862, at Library of Congress, URL: http://memory.​loc.​gov/​cgi-bin/​ampage?​collId=​mal&​fileName=​mal2/​423/​4233400/​malpage.db. Lincoln’s second inaugural address, at Yale’s Avalon Project, URL: http://avalon.​law.​yale.​edu/​19th_century/​lincoln2.asp. Locke’s Second Treatise of Civil Government at Constitution Society, URL: http://www.​constitution.​org/​jl/​2ndtreat.htm. Locke’s Two Treatises of Government at McMaster University, URL: http://socserv2.​mcmaster.​ca/​~econ/​ugcm/​3ll3/​locke/​government.pdf. Madison’s "Federalist 44" at Constitution Society, URL: http://www.​constitution.​org/​fed/​federa44.htm. Madison’s "Federalist 44" at Yale’s Avalon Project, URL: http://avalon.​law.​yale.​edu/​18th_century/​fed44.asp. Madison’s "Federalist 54" at Constitution Society, URL: http://www.​constitution.​org/​fed/​federa54.htm. Madison’s "Federalist 54" at Yale’s Avalon Project, URL: http://avalon.​law.​yale.​edu/​18th_century/​fed54.asp. Madison’s "Memorial and Remonstrance" at Library of Congress, URL: http://www.​loc.​gov/​exhibits/​madison/​images/​vc3.jpg. Madison’s "Memorial and Remonstrance" in The Founder’s Constitution at University of Chicago Press, URL: http://press-pubs.​uchicago.​edu/​founders/​documents/​amendI_religions43.html. Madison’s "Memorial and Remonstrance" at National Archives, URL: http://founders.​archives.​gov/​documents/​Madison/​01-08-02-0163. Madison’s Notes on the Constitutional Convention of 1787 at Constitution Society, URL: http://www.​constitution.​org/​dfc/​dfc_0000.htm. Marmor, Andrei, "The Nature of Law", Stanford Encyclopedia of Philosophy (Winter 2011 Edition), Edward N. Zalta (ed. ), URL: http://plato.​stanford.​edu/​archives/​win2011/​entries/​lawphil-nature/. 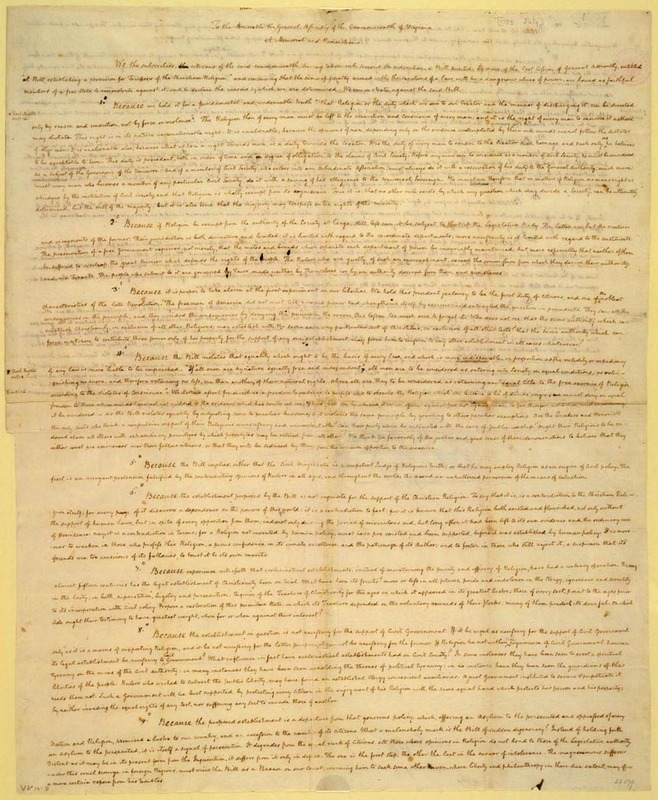 Mason’s initial draft of "The Virginia Declaration of Rights" at Virginia Memory, URL: http://www.​virginiamemory.​com/​docs/​VADeclaration.​pdf. Mason’s initial draft of "The Virginia Declaration of Rights" in The Founder’s Constitution at University of Chicago Press, URL: http://press-pubs.​uchicago.​edu/​founders/​documents/​v1ch1s3.html. "Mayflower Compact" at University of Oklahoma Law Center, URL: http://www.​law.​ou.​edu/​hist/​mayflow.html. "Mayflower Compact" at Yale’s Avalon Project, URL: http://avalon.​law.​yale.​edu/​17th_century/​mayflower.asp. Mayhew’s "A Discourse Concerning Unlimited Submission and Nonresistance to Higher Powers" excerpted at Hushmoney.org, URL: http://hushmoney.​org/​UnlimitedSubmission_Mayhew.htm. Miller’s "The Magical Number Seven . . . Our Capacity for Processing Information", at Green’s "Classics in the History of Psychology", URL: http://psychclassics.​yorku.​ca/​Miller/. "Money, Banking, and the Federal Reserve" at the "misesmedia" Youtube channel, URL: https://www.​youtube.​com/​watch?​v=YLYL_NVU1bg. Montesquieu’s The Spirit of the Laws at the Constitution Society, URL: http://www.​constitution.​org/​cm/​sol.htm. Montesquieu’s The Spirit of the Laws at the LONANG Institute, URL: http://lonang.​com/​library/​reference/​montesquieu-spirit-of-laws/. "Moses’ Law for Modern Government: The Intellectual and Sociological Origins of the Christian Reconstructionist Movement", by J. Ligon Duncan, III, at The-Highway.com, URL: http://www.​the-highway.​com/​recon_Duncan.html. Nixon’s "Special Message to the Congress on Indian Affairs", 1970, which called for "repeal the termination policy", at "The American Presidency Project" at U.C. Santa Barbara, URL: http://www.​presidency.​ucsb.​edu/​ws/​index.​php?​pid=​2573&​st=​&​st1. "North American Indian Timeline", part of "Imperialisms, Ancient and Modern", a course at George Mason University, URL: http://www.​thelatinlibrary.​com/​imperialism/​notes/​nativeamericanchron.html. O’Connor’s dissenting opinion in Boerne v. Flores at Cornell’s Legal Information Institute, URL: http://supct.​law.​cornell.​edu/​supct/​html/​95-2074.ZD.html. Pascal’s Pensées through Christian Leadership Ministries, URL: http://www.​leaderu.​com/​cyber/​books/​pensees/​pensees.html. "Pelagian Captivity of the Church", by R.C. Sproul, at The-Highway.com, URL: http://www.​the-highway.​com/​pelagian_Sproul.html. "Religious Freedom Restoration Act of 1993" at Congress.gov, URL: https://www.​congress.​gov/​103/​bills/​hr1308/​BILLS-103hr1308eas.pdf. Statement of Reuben A. Snake, Jr., Coordinator, Native American Religious Freedom Project, entered into the Congressional Record by Senator Inouye, June 29, 1993, available at Library of Congress web site, URL: http://thomas.​loc.​gov/​cgi-bin/​query/​F?​r103:1:./​temp/​~r103pvCY1x:e1: (If this URL produces an error, search the 103rd Congress for "Reuben Snake".). Rothbard’s For a New Liberty, at Ludwig von Mises Institute, URL: http://mises.​org/​rothbard/​foranewlb.pdf. Rothbard’s The Ethics of Liberty, at Anarcho-Capitalist, URL: http://anarcho-capitalist.​org/​wp-content/​pdfs/​Rothbard​%20%28Murray%29​%20-​%20The​%20Ethics​%20of​%20Liberty.pdf. Spurgeon’s sermon, "A Question for a Questioner: A Sermon Intended for Reading on Lord’s Day Morning, May 31st, 1885", at The Reformed Reader, URL: http://www.​reformedreader.​org/​spurgeon/​1885-01.htm. Supreme Court opinions and other federal case law at Google Scholar, URL: https://scholar.​google.​com/. Theopedia: An Encyclopedia of Biblical Christianity, URL: http://www.​theopedia.​com. Tucker’s Blackstone at Constitution Society, URL: http://www.​constitution.​org/​tb/​tb-0000.htm. Uniform Commercial Code as copyrighted by The American Law Institute and the National Conference of Commissioners on Uniform State Laws, at Cornell’s Legal Information Institute, URL: https://www.​law.​cornell.​edu/​ucc. Uniform Commercial Code as enacted in Minnesota Statutes, URL: https://www.​revisor.​mn.​gov/​statutes/​?id=336. Uniform Commercial Code as enacted in Oregon Statutes, URL: https://www.​oregonlegislature.​gov/​bills_laws/​ors/​ors071.html. Uniform Commercial Code as enacted in Texas Statutes, "Business and Commercial Code", Title 1, URL: http://www.​statutes.​legis.​state.​tx.​us/. United States Code at Cornell’s Legal Information Institute, URL: https://www.​law.​cornell.​edu/​uscode/​text. Virgina Bill of Rights, June 12, 1776, at Constitution Society, URL: http://www.​constitution.​org/​bor/​vir_bor.htm. Virgina Declaration of Rights (1776), Madison’s amendments, at Constitution Society, URL: http://www.​constitution.​org/​jm/​17760611_rights.htm. Washington’s Farewell Address, 1796, at Yale’s Avalon Project, URL: http://avalon.​law.​yale.​edu/​18th_century/​washing.asp. "What is Christian Hedonism" at Enjoying God Ministries, URL: http://www.​enjoyinggodministries.​com/​article/​what-is-christian-hedonism.